There's a cup-type plug installed to close the orifice in the end of the mainshaft on 1969 and earlier Turbo Hydra-Matic 400 transmissions. The plug is omitted in 1970 production to improve the flow of lubricant to the output-shaft thrust washer. Plug in end of Turbo Hydra-Matic 400 mainshaft should be removed when unit is overhauled. 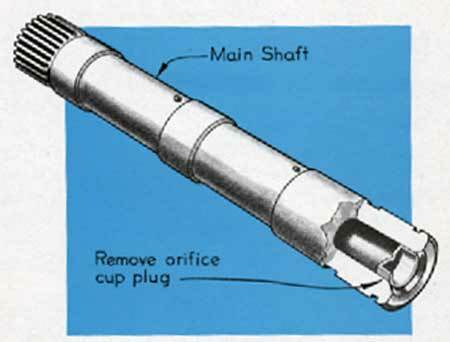 When overhauling a pre-1970 unit, the plug in the end of the mainshaft should be removed and discarded. This can be done quite easily by inserting a 12 in. length of 1/4 in. rod from the front of the shaft to drive out the plug. If the mainshaft requires replacement, remove the plug from the new part before installation. The above procedure also applies to other GM-built cars equipped with this transmission.